Cartoonist and self-publisher Randy Reynaldo, who has been plugging away on his breezy action-adventure series, Rob Hanes Adventures, since the early 1990s—surely making it as one of the long-running indy titles still going—announced that he’ll again be exhibiting in the Small Press Area of the San Diego Comic-Con, scheduled July 20-23, 2017. He’ll be at the same location he’s held in recent years, Booth K1 in the Small Press Area (up aisle 1500 on the main floor), under his WCG Comics imprint. Reynaldo has been a regular fixture at the show since 1993, the year Comic-Con introduced the Small Press Area, and 2017 marks his 19th appearance at Comic-Con. “Given the large backlist of issues now in the catalog, it was time to make it easier for people—especially new readers—to begin collecting the series,” said Reynaldo. Issue 18 promises to generate particular interest at Comic-Con since the issue takes place at a large (but unnamed) comics convention. 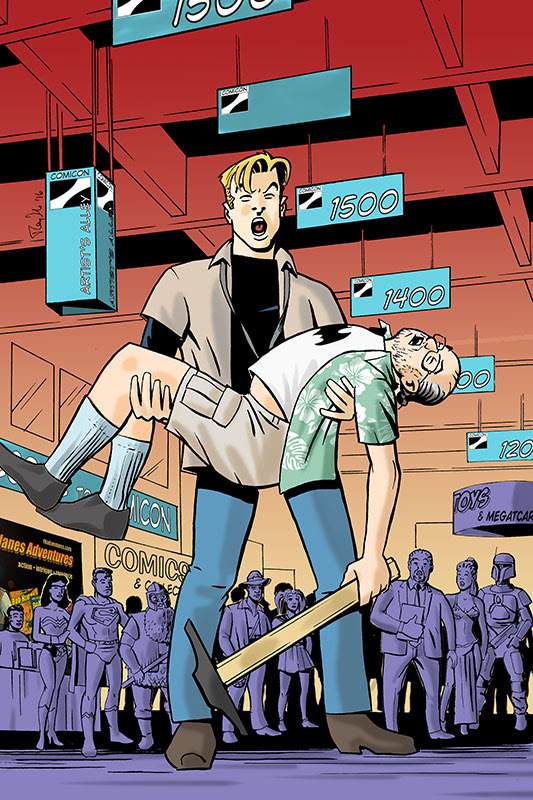 Titled “Death at Comicon,” Rob is hired to protect a valuable, rare and highly sought-after comic-book. However, when the issue is stolen and a respected comic-book artist is murdered, Rob investigates and uncovers the sordid underbelly of fandom and the comic-book collectibles market! The issue features cosplayers, cameo appearances, and a climactic scene that takes place during a comicon panel. The issue also includes a bonus backup story, “Prufrock,” which serves as a teaser for issue 19 that will take the series in a startling new direction, when the U.S. government nationalizes Rob’s detective agency, Justice International, turning it into a private police force and intelligence agency for the higher reaches of the government. Rob Hanes Adventures has often featured stories “pulled from the headlines” and upcoming issues will reflect the polarized political landscape of modern-day America. 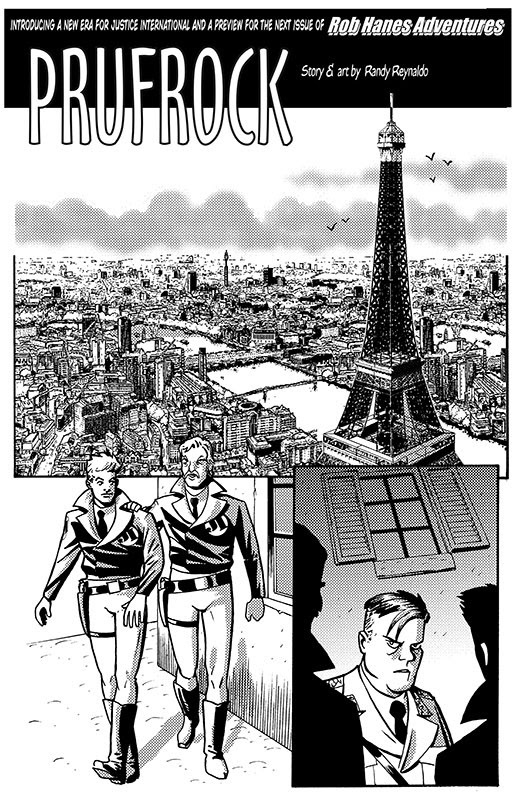 For those new to the series, Rob Hanes Adventures is an action-adventure series about a globetrotting private eye and troubleshooter from Justice International who travels the world on assignment, facing adventure, intrigue and romance at every turn. Over the years, the story has enjoyed playing in a variety of genres with good humor, and with every issue a stand-alone story, it’s very easy for readers to jump in with any issue. 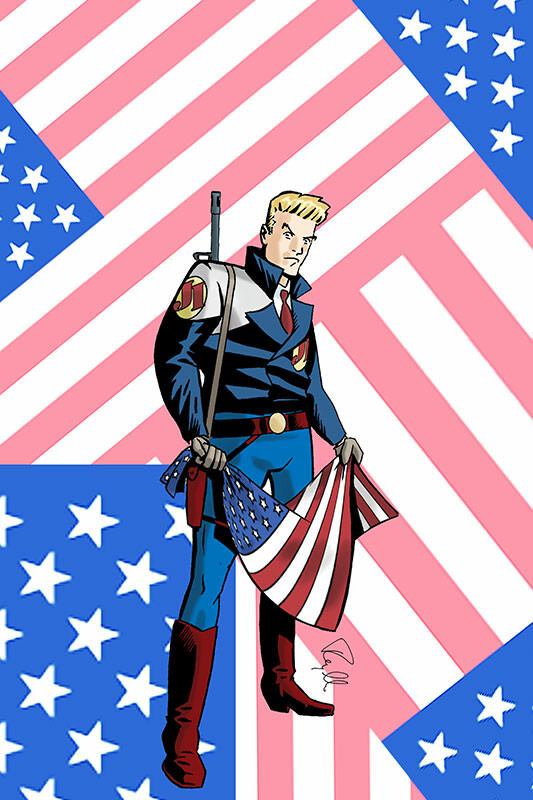 Launched in 2000, and preceded by a zine and a comic-book series that ran four issues titled Adventure Strip Digest, Rob Hanes Adventures is one of the longest-running indie comics series still going! 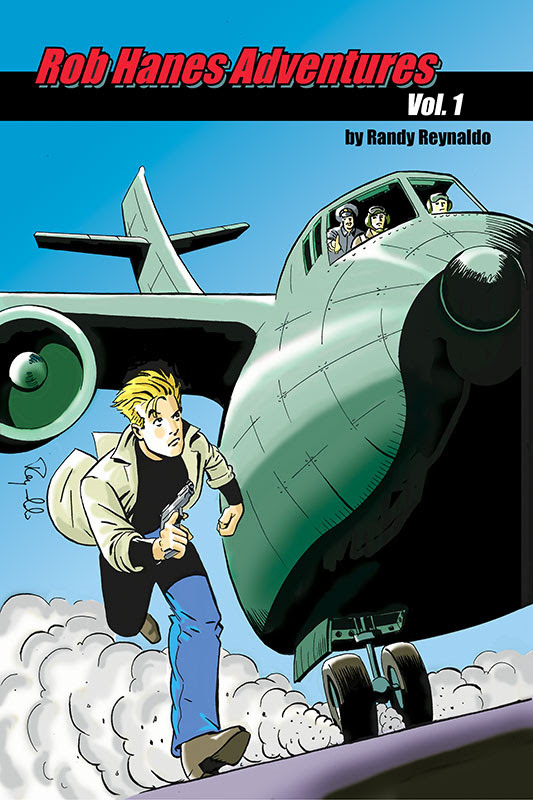 Inspired by classic adventure comic strips like Milton Caniff's Terry and the Pirates and Roy Crane's Buz Sawyer but set in the modern day—with dashes of light-hearted humor reminiscent of Will Eisner's Spirit—readers and fans have praised Rob Hanes Adventures for recapturing the spirit of the classic adventure strip and updating it for modern day audiences. Though themes and characters recur in the series, every issue of Rob Hanes Adventures is self-contained. 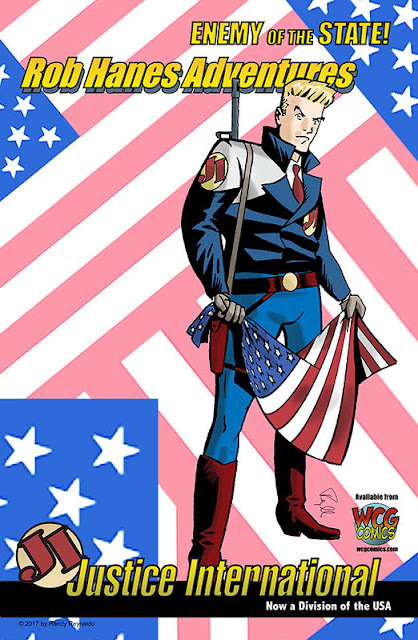 The entire series remains in print, including 17 issues to date and two trade paperback collections of earlier work. For more information about the series, previews and to purchase back issues, visit the WCG Comics website at wcgcomics.com or facebook.com/rhadventures. Scroll down for images from these publications. Images accompanying this press release may be used for review purposes, with additional downloadable art and images from the comic-book series available in our online media room. All art © by Randy Reynaldo. All rights reserved. 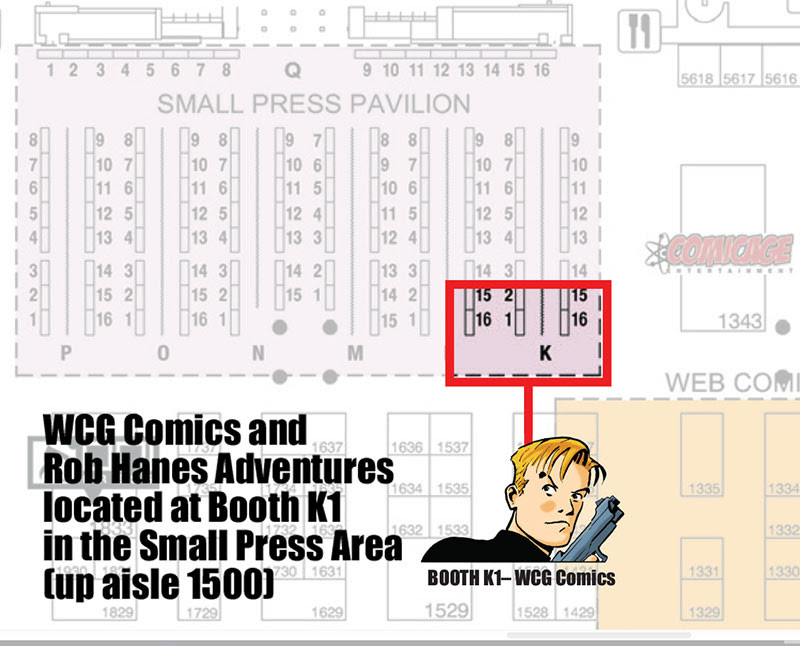 For additional information or interview inquiries, please contact WCG Comics.